Four personalities have been shortlisted for the 2018 F1Stockcars.com Stox Personality of the Year award. This time, the nominees were chosen by last year’s winner, Stuart Smith Junior. One nominee will be announced each day – so make sure you keep checking the site! The first two were Conrad Wilson and Nigel Harrhy. Once all nominations have been announced, you will be able to vote for your favourite via the F1Stockcars.com website. Voting will open on Saturday 8 December and will close at midnight on Saturday 15 December. The winner will be announced on Sunday 16 December. For the first time, we have a joint nomination for Stox Personality of the Year. The first of the pairing, Rob Speak, will be instantly recognisable to any oval racing fan. The multiple gold and silver roof winner dominated Formula 2 in the 1990s and stepped up to Formula 1 in 1999, adding yet more silverware to his vast collection. But he retired from racing at the end of the 2016 season to go into business with his wife, Asha – the second of the joint nominees – as the new owners and promoters of Skegness Stadium. It was a surprising move, not the least because Speak had spent the past few years lovingly building a family home in Greater Manchester, some 150 miles and a three-hour drive away from their new investment. It has taken two years for the family to settle on the east coast, but the move is finally coming to fruition and the Speaks should spend a little less time on the M62 and M180 in the 2019 season. It has been a while since a former driver has stepped up to become a promoter. Stuart Bamforth did it in the 1970s, becoming renowned for staging meetings at Odsal which are now looked back on fondly by fans with long memories. Stuart and Harry Smith also joined forces at Scunthorpe, although that experiment was less successful. But Speak’s vast experience on the racing side of the fence gives him a perspective that the other oval racing promoters lack. He has spoken of the need to streamline the decision-making process, with a driver representative and promoter representative thrashing things out for the good of the sport as a whole, rather than relying on larger committees. Asha comes to the promoting game from a different perspective again. She is grounded in horsepower of a different kind, namely endurance horse riding – indeed, finding somewhere suitable for the horses was part of the reason why it has taken the Speaks two years to move to Skegness. But Asha offers an outsider’s perspective, suggesting ideas and solutions that may not occur to those with decades in the oval racing world. Being owners of the stadium also means that Rob and Asha can invest and upgrade the physical buildings as they see fit, rather than relying on the goodwill of a third-party stadium owner. Over the last two years, fans who flocked to the racetrack have welcomed the ongoing improvements. However, although improving the fan experience is a hugely important reason for the work, it isn’t the only one. Rob has spoken of his long-term aim to make Skegness Stadium one of the premier ovals in the country to try to win a share of the corporate sponsorship pot. He tends to stick to the day-to-day job of running the stadium and overseeing the various building projects, while Asha oversees the vital paperwork and puts in the office hours that no small business owner can avoid. The sternest test so far of Rob and Asha’s working partnership came at the 2018 F1 World Final. That most fans came away happy indicates that they passed the test with flying colours. Although the big race was not a classic, most people were happy with the winner (unless you live in Silsden). The fireworks and pre-racing stunt bike entertainment were popular, as was the open-to-all grid walk. But best of all was the work that went on in the background to ensure an efficient, well-run meeting including ample staff on the turnstiles and a knowledgeable commentary team who kept spectators informed. 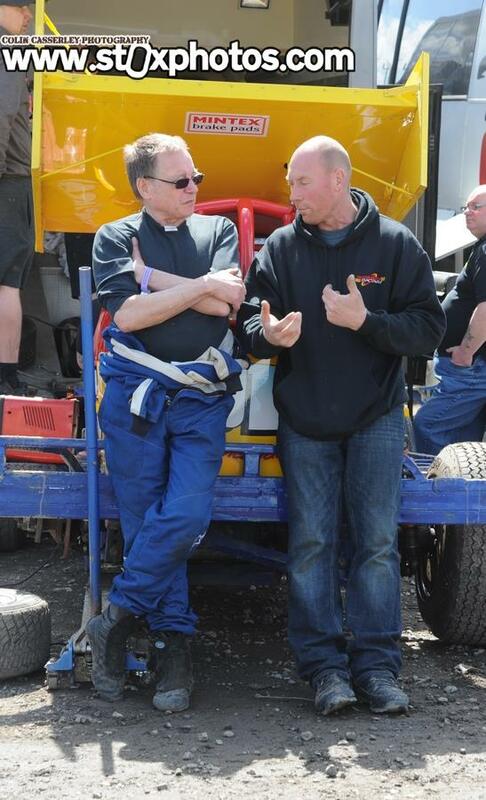 If the Speaks can be as successful at promoting as Rob was behind the steering wheel, expect their ambitious long-term plan for Skegness Stadium to be more than fulfilled.